Here we provide recommendations for the use of viral vaccines in anticipation of the 2014 southern hemisphere influenza season. For a review of the 2013 influenza season, please refer to the National Institute for Communicable Diseases, National Health Laboratory Service website (http://www.nicd.ac.za). Vaccines should contain 15 ug of each haemagglutinin antigen in each 0.5 ml dose. • Any persons wishing to protect themselves from the risk of contracting influenza, especially in industrial settings where large-scale absenteeism could cause significant economic losses. • The influenza vaccine is not recommended for infants <6 months of age. • Persons with acute febrile illnesses should preferably be immunised after symptoms have disappeared. Vaccines should be given sufficiently early to provide protection for the winter. A protective antibody response takes about two weeks to develop. 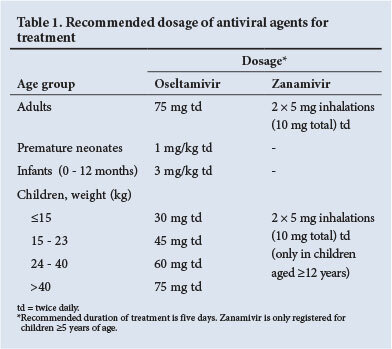 At present, influenza A (H1N1) pdm09 and H3N2, and influenza B viruses remain sensitive to oseltamivir (and zanamivir). The dosages for treatment and post-contact prophylaxis (where indicated) are provided in Table 1. Antiviral chemoprophylaxis for the contacts of persons infected with influenza is currently not recommended. Recent WHO recommendations advise presumptive treatment using the treatment regimen described above for higher-risk individuals (patients with severe immunosuppression or transplant patients) exposed to influenza instead of the previously recommended long-term lower-dose chemoprophylaxis regimen. These higher-risk individuals need to be carefully monitored during the influenza season for early signs and should then be treated immediately on suspicion of infection. For a more detailed description of antiviral management and chemoprophylaxis of influenza, please refer to the National Institute for Communicable Diseases Healthcare Workers Handbook on Influenza. For the full report on recommended influenza vaccines, refer to the WHO recommendations.